Sinha, A., Prakash Phukan, J., Bandyopadhyay, G., Sengupta, S., Saha, R. (2013). Superficial Acral Fibromyxoma: a Rare Tumor Diagnosed by Cytology. Iranian Journal of Pathology, 8(1), 59-63. Anuradha Sinha; Jyoti Prakash Phukan; Gautam Bandyopadhyay; Sanjay Sengupta; Rinki Saha. "Superficial Acral Fibromyxoma: a Rare Tumor Diagnosed by Cytology". 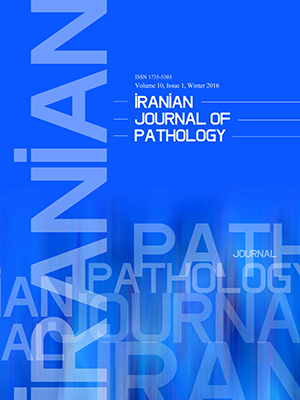 Iranian Journal of Pathology, 8, 1, 2013, 59-63. Sinha, A., Prakash Phukan, J., Bandyopadhyay, G., Sengupta, S., Saha, R. (2013). 'Superficial Acral Fibromyxoma: a Rare Tumor Diagnosed by Cytology', Iranian Journal of Pathology, 8(1), pp. 59-63. Sinha, A., Prakash Phukan, J., Bandyopadhyay, G., Sengupta, S., Saha, R. Superficial Acral Fibromyxoma: a Rare Tumor Diagnosed by Cytology. Iranian Journal of Pathology, 2013; 8(1): 59-63. Superficial acral fibromyxoma are rare soft tissue tumors predominantly involving hands and feet of adults. There are only a few reported cases of this benign neoplasm, but no FNAC diagnosis of this tumor is reported in the literature. A Forty-eight year old female presented with a 5 x 3.5 cm globular, firm swelling over the right fifth toe. Fine needle aspiration cytology (FNAC) of the lesion was interpretated as superficial acral fibromyxoma, and Subsequent histopathology confirmed the diagnosis and demonstrated cytohistological correlation for the first reported time in the literature. SAFM may recur if not adequately excised. Preoperative FNAC diagnosis will help the surgeons to plan for wider excision to prevent recurrence. Fetsch JF, Laskin WB, Miettinen M. Superficial acral fibromyxoma: a clinicopathologic and immunohistochemical analysis of 37 cases of a distinctive soft tissue tumor with a predilection for the fingers and toes. Hum Pathol 2001;32:704-14. Andre J, Theunis A, Richert B, de Saint-Aubain N. Superficial acral fibromyxoma: clinical and pathological features. Am J Dermatopathol 2004;26:472-4. Meyerle JH, Keller RA, Krivda SJ. Superficial acral fibromyxoma of the index finger. J Am Acad Dermatol 2004;50:134-6. Oteo-Alvaro A, Meizoso T, Scarpellini A, Ballestin C, Perez-Espejo G. Superficial acral fibromyxoma of the toe, with erosion of the distal phalanx. A clinical report. Arch Orthop Trauma Surg 2008;128:271-4. Goo J, Jung YJJ, Kim JH, Lee S, Ahn SK. A case of superficial acral fibromyxoma. Ann Dermatol 2010;22:110-3. Abou-Nukta F, Fiedler P, Parkash V, Arons J. Superficial acral fibromyxoma of the distal phalanx of the thumb. J Hand Surg[Br] 2006;31:619-20. Ashby-Richardson H, Rosers GS, Stadecker MJ. Superficial acral fibromyxoma An overview. Arch Pathol Lab Med 2011;135:1064-6. AI-Daraji WI MD, AI-Daraji U, AI-Mahmoud RMW. Superficial acral fibromyxoma: Report of two cases and discussion of the nomenclature. Dermatol online J 2008;14(2):27. Graadt van Roggen JF, Hogendoom PC, Fletcher CD. Myxoid tumors of soft tissue. Histopathology 1999;35:291-312. Weedon D. Skin Pathology. 2nd ed. London:Elsevier Science Ltd;2002. Zelger BG, Calonje E, Zelger B. Myxoid dermatofibroma. Histopatholgy 1999;34:357-364. Lee KJ, Kim WS, Lee JH, Wang JM, Lee ES, Mun GH, et al. CD 10, a marker for specialized mesenchymal cells (onychofibroblasts) in the nail unit. J Dermatol Sci 2006;42:65-7. Toma JG, McKenzie IA, Bagli D, Miller FD. Isolation and characterization of multipotent skin-derived precursors from human skin. Stem Cells 2005;23:727-37. Al-Daraji WI, Miettinen M.Superficial acral fibromyxoma: a clinicopathological analysis of 32 tumors including 4 in the heel. J Cutan Pathol 2008;35:1020-6.